In Wadi Halfa, after crossing the border and waiting for the cars to arrive (two separate ferries), we found a local hang out and caught the Egypt-England match. 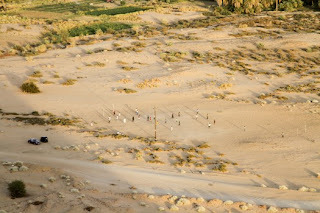 Throughout the trek across Sudan, you could always count on finding a football match as the sun began to set. When the heat of the day begins to wane, it's time to kickabout. Informal. Competitive. Open. The pick-up games are great fun. 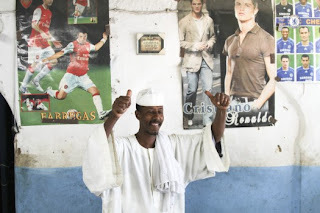 Making our way to Khartoum, we check out ancient artifacts and learn a ton about Sudan and Nubian history. 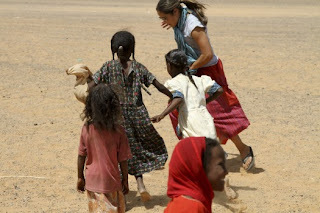 One of the real highlights came at the ruins of the Royal City of Meroë. After our visit to the tombs, Tom and Maria wanted to go visit a man named Umda. Umda himself was not the object of their affection, but instead his young niece named Vitalmina. 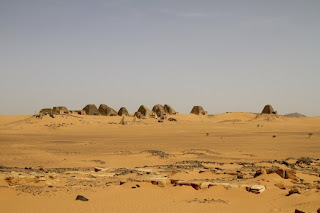 The last time they visited the Sudan they encountered Umda, sitting outside of the Royal City near Meroe, and noticed a small, shy young lady who was charged with leading him around. She was his eyes. They fell in love with her 3 years ago and Maria had carried a scarf along for Vitalmina that she had saved for her. When we arrived at the gate of the royal city, we found no Umda, only a small boy. We inquired after Umda and the boy hopped in the Land Cruiser with us and directed me to Umda’s house. Umda, having lost his sight, developed an impeccable memory for voices and remembered Tom and Maria by voice! At first the kids were shy and while the crew sat inside of Umda’s hut waiting to take chai with him, I decided to pull out the ball and kick it around with them. As soon as I pulled out the ball, the wall between us fell. I started by kicking it to one of the boys, who then kicked it directly back to me. Next to one of the girls. She knocked it back. It went on like this for a little while until everyone was comfortable. An errant kick sent 3 or 4 of the kids chasing after the ball. Then it began. The game of “dribble until you lose it.” The boys and girls were laughing and kicking the ball; the girls went over and grabbed Maria, even convincing her to play. It was a wonderful experience, playing with these kids who had noting and watching them laugh. When it was time to leave, none of them asked for money. None of them asked for food. They didn't ask for anything. After a week of bartering, haggling, negotiating, saying no/yes/no/yes, etc., I was more than expecting the kids to ask for a ball, at the very least. 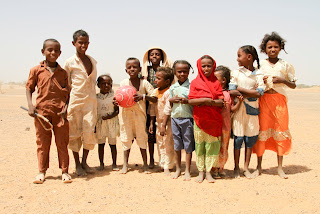 These beautiful children, who have very little and yet, ask for nothing, humbled me. Seeing the great fun they had playing, giving the ball to them was the least I could do. But before I handed the ball to Umda to hold for the kids we made them promise that they would share the ball, play every day, and INCLUDE THE GIRLS! They all agreed and the ball was theirs. As we drove away, Awad remarked to us in a quiet voice, “You made them very happy today.” As the dust gathered behind us, we drove off. “Very happy.” Awad repeated. 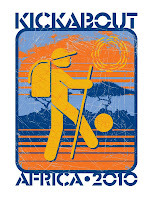 2 comments: on "Kickabout Sudan"
The kids look so cute! It's great that you guys left the ball!